Skingrad Patroller is a common Willpower creature card. It is part of the Core Set. "By Kynareth, respect my power and feel my fury!" "Their deaths will bring glory to the Empire!" The card is named for the Cyrodiil city of Skingrad. 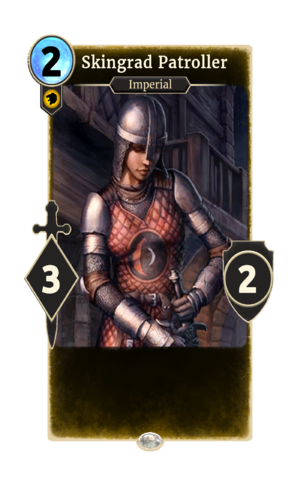 This card is named "Kvatch Patroller" in the audio files. This page was last modified on 15 February 2019, at 12:18.